I’ve just acquired Jamie Oliver’s new book, Jamie Cooks Italy. It’s beautiful! A wealth of fantastic recipes which highlight the breadth and depth of Italian cooking. Here is a link to the book. I couldn’t wait to start my baking, so this weekend I made a lovely chicken dish, “Chicken under a Brick”. More of this in a later post! I also baked “Pear and Hazelnut Tart”, a twist on a classic frangipane tart. The frangipane is made with hazelnuts rather than almonds. You process whole hazelnuts, so the texture is quite gritty compared with traditional almond or hazelnut meal. Pears are baked on top of the frangipane. The pastry and frangipane are both flavoured with orange zest, which adds to the piquancy of the tart. Here’s Jamie’s recipe as is. A couple of notes – I roll the pastry between clingfilm as this is far easier and less messy than the traditional way! I also substituted baking paper for non-PVC clingfilm in order to bake the tart blind, as I’m not sure you can get the latter in Australia. Spoon the frangipane into the pastry case in an even layer, then arrange the pear quarters on top. Bake at time bottom of the oven for 40 minutes, or until golden. Leave for 5 minutes in the tin, then release and serve warm. Nice with orange-spiked crème fraîche and crumbled toasted hazelnuts. Posted in Cakes, Dessert, Jamie Oliver, Sweet Food and tagged afternoon tea, frangipane, fruit flan, nuts, pastry, rustic, vanilla. Bookmark the permalink. It’s winter in the Southern Hemisphere, and in Sydney we’re experiencing a really crisp winter, which I love, as I’m a fan of the cold weather. Quinces are in season and I make a few quince recipes at this time of year. One of my favourites is baked quince with crumble, slices of slowly baked quince with a crumble topping and thick cream. Quinces go well with pastry, so I recently made a rustic quince tart, a simple sweet short crust pastry base, baked free-form, topped with cookedquince. The pastry recipe is from a recipe for Red Apple Rustic Tart, and the baked quince is adapted from a recipe for Quince Shortcake. Preheat oven to 150 degrees C. Peel the quinces, halve lengthways and remove cores. Cut in slices and put the slices in a small baking dish. Scatter over sugar and squeeze over the lemon juice. Cover tightly with a doubled sheet of foil. Bake the quinces for 2-3 hours, basting a few times through the process, until the quinces are soft and a ruby red colour. Remove from the dish to cool. Pulse flour, butter, sugar and salt in food processor, until the consistency of coarse breadcrumbs. Add enough iced water to bring the pastry together – be careful not to over mix. Wrap the pastry in cling film and refrigerate for 20 -30 minutes. Turn the oven up to 170 degrees C. Butter a baking dish. Remove the pastry from the fridge and roll out between 2 sheets of cling film. Remove from the cling film and drape over the baking dish, shaping rough sides inside the dish. This is a free-form tart so there is no need to make it look “pretty” or too even. Place the baked quince slices on top of the pastry higgledy piggledy, the more rustic the better. Sprinkle the additional sugar liberally over the edges of the pastry. Place in the oven and bake for 20-25 minutes until the pastry is crisp and golden brown. Serve warm with whipped cream or thick Greek yoghurt. Posted in Cakes, Dessert, Pies, Tarts and Quiches, Sweet Food and tagged fruit pie, rustic, sweet pastry, Sydney winter, winter cooking. Bookmark the permalink. 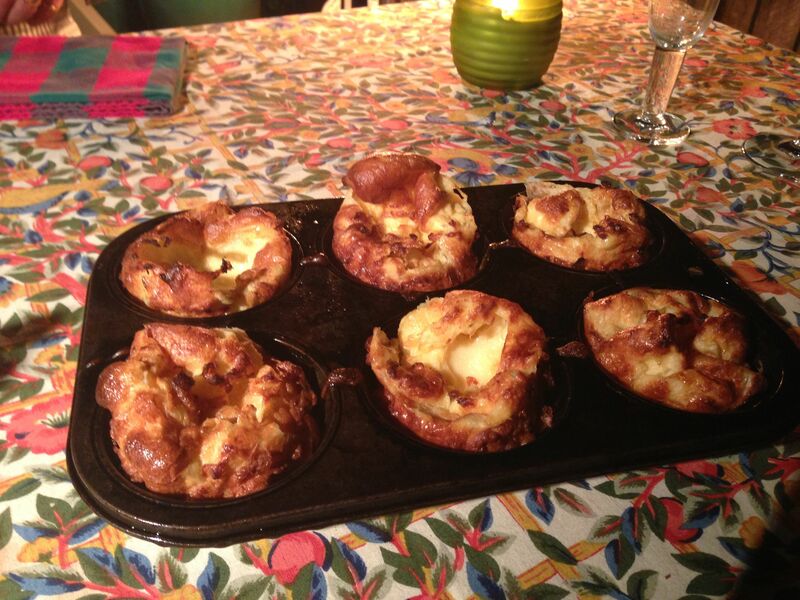 I’m always looking for simple bakes for afternoon tea or for when friends drop over unexpectedly. This is an easy recipe to make. You just need to bake the quinces beforehand. In autumn and winter in Sydney, in what passes for the cooler months here, I buy quinces pretty regularly, and slow cook them in the oven ready for this recipe, or to fill a tart or have for breakfast with yoghurt and granola. For the quince, peel the quince, halve lengthways and remove core. Cut in slices and put the slices in a small baking dish. Scatter over sugar and squeeze over the lemon juice. For the shortcake, beat the butter and castor sugar until creamy. Add the egg and mix well. Add the flour and baking powder, then stir until only just combined. Add half the quince slices, and combine until the mixture comes together into a dough, but don’t overwork the dough. Turn the oven to 180 degrees C. Grease and line a baking tray. With floured hands, put the dough onto the baking tray, then shape the dough into a round. Mark the round into 6 wedges. Bake for 25- 30 minutes or until until golden (cover loosely with foil if browning too quickly). Once cool, dust the shortcake with sifted icing sugar, and serve with cream and the remaining quince slices. Posted in Cakes, Pastries, Sweet Food and tagged afternoon tea, rustic, scones, winter fruit. Bookmark the permalink. 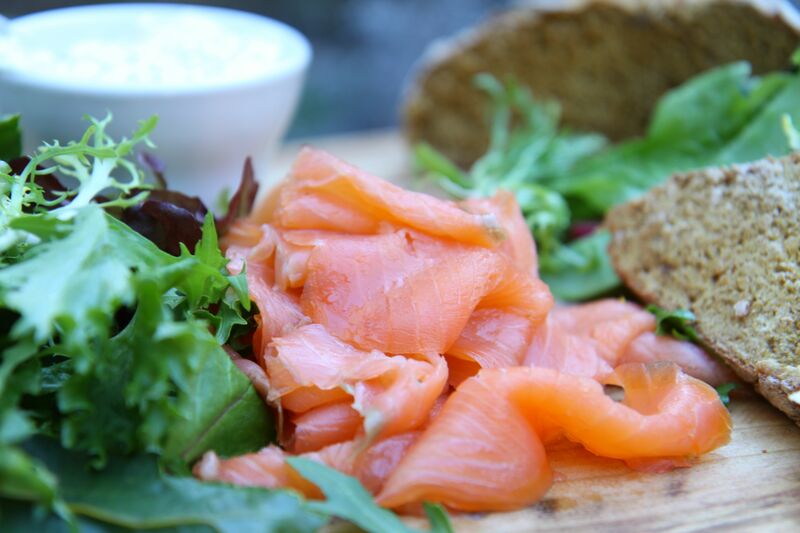 This is a simple lunch or dinner for the start of spring, even better served in the garden! 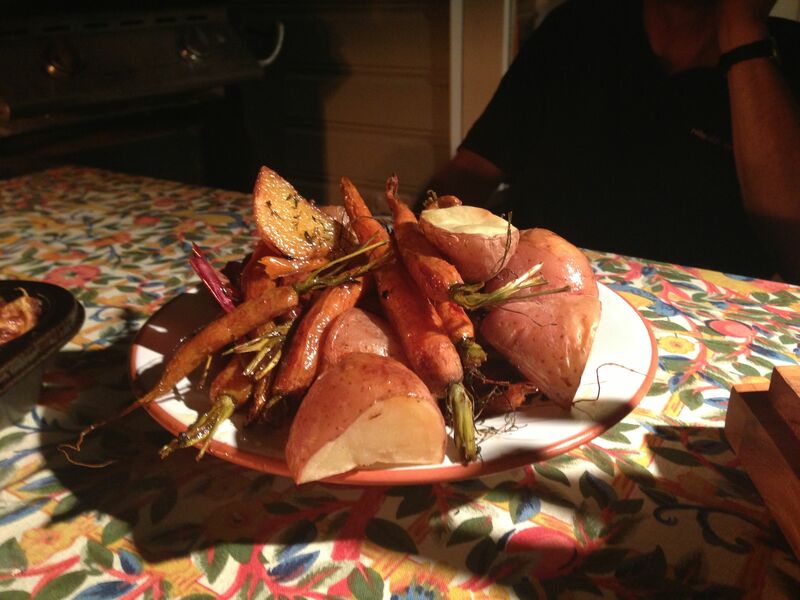 Very rustic and easy to prepare. Jamie Oliver was the inspiration. Mix a couple of spoonfuls of sour cream or creme fraiche with a teaspoon full of creamed horesradish and a little french mustard. 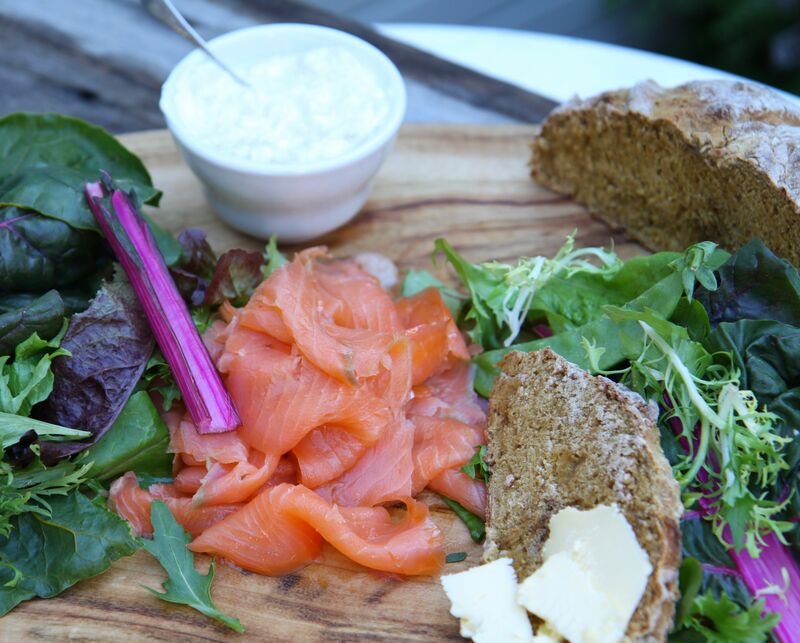 Posted in Fish, Savoury Food and tagged crema fraiche, garden, horeradish, Irish soda bread, lunch, rustic, salad greens, smoked salmon, sour cream. Bookmark the permalink. A very rustic repast with old friends on a perfect Sydney autumn night – it was warm enough that we could still eat outdoors. Roast rib of beef with the trimmings, a wonderful lemon cake, and a great cab sav from Stag’s Leap in the Napa Valley. The most important thing is to buy good meat. 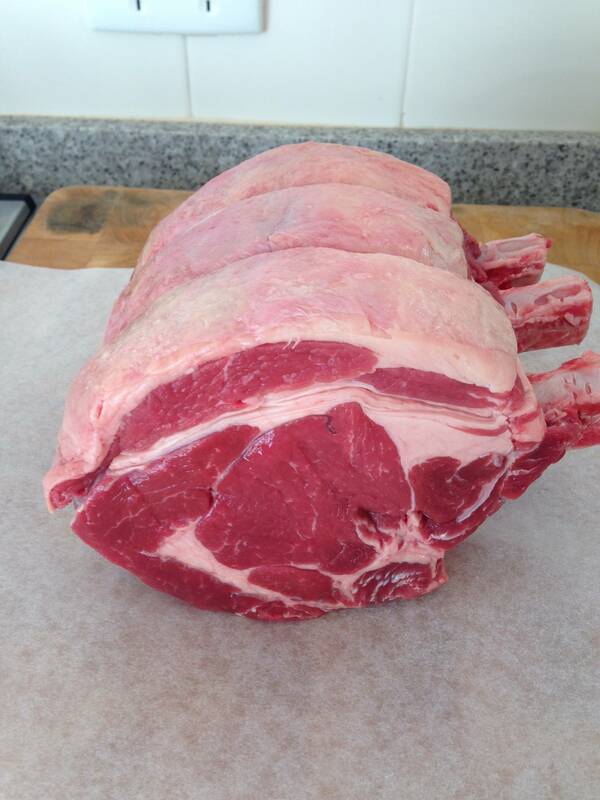 Make sure the beef you buy is a good dark red colour, not bright red, and has a nice marbling of fat. 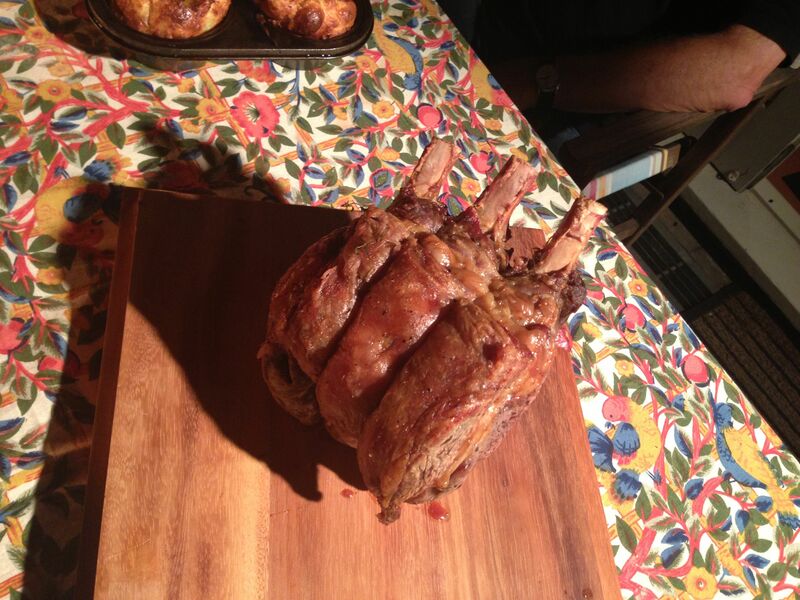 This beautiful piece of meat is pasture fed, free range, the only meat to buy from the ethical and taste point of view. Heat the oven to 220 degrees C. Season the joint heavily with freshly ground black pepper and sea salt, rubbing it into the fat and flesh. Heat olive oil in a heavy bottomed roasting pan and sear the meat quickly on all sides, including the ends, until you get a nice dark brown colour then remove the meat and set aside. Make a bed of red onions cut in halves or thirds, and place with garlic and some thyme in the bottom of the roasting pan, sitting the meat on top. Roast for 15 minutes then turn the oven down to 160 degrees C and continue to cook for 15 minutes per 450 grams for rare or 20 minutes per 450 grams for medium. An hour from the completion of cooking, scatter some baby carrots and potatoes into the pan, or whatever root vegetables take your fancy, making sure to baste with the pan juices. When cooking is complete, remove the roast meat from the pan, wrap it in foil and rest it on a plate for a 20 to 30 minutes. Remove the vegetables to a plate and also cover with foil. To make the gravy, put the roasting pan over a medium heat on the stove top. Add a tablespoon of beurre manié to the pan (equal quantities of flour and butter combined together to thicken the gravy). Tip in a half a bottle of good red wine, scraping the crunchy bits off the base of the pan. Add some chicken stock and the pan juices from the beef, and the juice of an orange or lemon for piquancy. Cook gently until the gravy has thickened. When you have taken the beef form the oven to rest, heat the oven to high (about 220 degrees C) while you make your Yorkshire pudding batter. Beat eggs, flour, milk and a pinch of salt together, either by hand or in a food processor, until light and smooth. Transfer the mixture into a jug. I make this ahead of time – the mixture actually improves in the fridge. Pour a small amount of oil into a muffin tin, so you have a thin layer covering the bottom of each muffin well. Pop the tray on to the top shelf in the hot oven for around 10 to 15 minutes, so the oil gets so hot that it smokes. Carefully take the tray out of the oven and quickly and confidently pour the batter into the hot tin so it nearly fills each well. Return the tray to the top shelf of the oven to cook for around 10 to 12 minutes, or until the Yorkies are puffed up and golden. Whatever you do, don’t open the oven door! Serve beef, veggies, yorkies and gravy with the bottle of red and a crisp green salad. 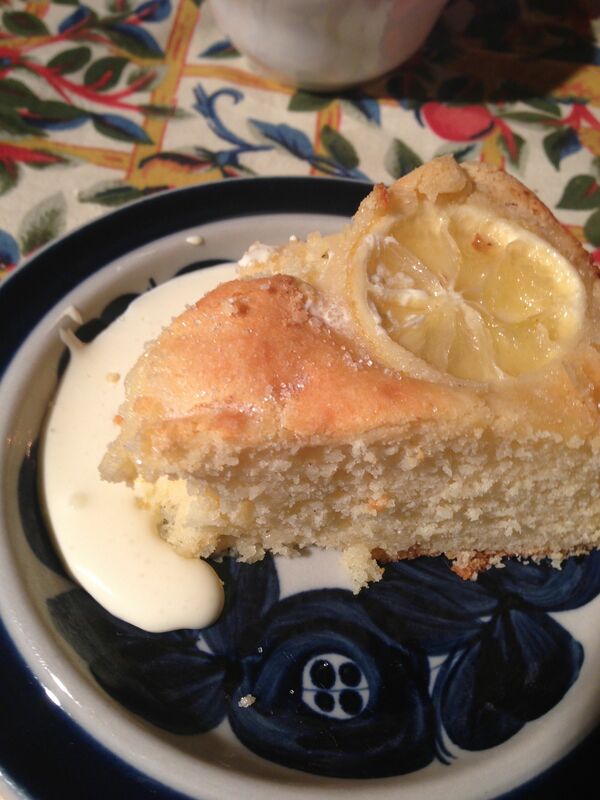 Finish the meal with the delightful Lemon, Yoghurt and White Chocolate Cake already featured in a recent post. Posted in Savoury Food, Sweet Food and tagged beurre manié, cabernet sauvignon, gravy, lemon cake, Roast beef, rustic, Yorkshire pudding. Bookmark the permalink.